As Jeff Bezos stepped out on stage at Amazon's press conference in Santa Monica last night, two things were apparently certain. One, Amazon would finally see it fit to unveil the Android-based smartphone it had be cooking up. And second, the successor to mid-level tablet the Kindle Fire would finally be on its way. That the online retailer chose to forgo revealing the phone that tech blogs were adamant was behind the metaphorical curtain (with the likes of The Verge and The Telegraph assuming as much) is a credit to the unwieldy power the Kindle range now possesses. For this, unreservedly, was the night of the Kindle. However popular the Kindle Fire would prove to be in its domestic US; the 7-inch, moderately powerful, Gingerbread-running, reasonably priced tablet was never going to set the world alight. Its confinement to sale in the US was pertinent: Amazon used it to test the waters of the now flourishing tablet market. As the retailer now prepares itself to make the Fire available outside of the US for the first time, the results from that same test seem to be revealing themselves. The Fire was undoubtedly a success – the tablet went on to sell out and claim, according to Amazon itself, a 22% tablet market share in the US – even if consumer satisfaction stooped (our previous comment about setting the world alight stands firm). A Kindle Fire successor, ever since, has been long overdue. Taking on the critically-admired and consumer-friendly Nexus 7 from Google is not going to be easy for Amazon, but with the Kindle Fire HD it has a tremendous shot. While it will once again be the US getting first dibs on certain Fire HD models – both an 8.9-inch and 4G LTE tablet were announced – what us UK folk receive is sure to tide us over for a little while at least. Because while what we'll be seeing is just the standard 7-inch, HD model, am upgraded HD display (1280 x 800) is the very start of many notable improvements over the Fire – the Kindle Fire HD 8.9 packs a handsome 1920 x 1200 pixel display – with the Fire HD the first tablet, as Amazon is intent to spell out, with dual-band (2.4Ghz, 5Ghz) MIMO technology, making this purportedly the fastest web browser in the market. Add to that dual stereo speakers with Dolby Digital Plus, a front-facing HD camera and HDMI connection out, as well as the company's claims the device's Wi-Fi is 41-percent faster than the new iPad, is a solid 40% faster than its predecessor, and even has reduced screen glare due to its laminated screen and you have yourself a worthy competitor in the now ultra-competitive 7-inch tablet market - and that's before even Apple joins the party with its rumoured iPad Mini. Though its dual-core 1.2Ghz TI OMAP 4470 processor seems unlikely to give the Nexus 7 (quad-core NVIDIA Tegra 3) a run for its money, its price will do. The Kindle Fire debuts in the UK at just £129, the Fire HD meanwhile comes in two variants of 16Gb and 32Gb and is priced at £159 and £199. The Nexus 7, comparably, comes in either 8Gb or 16Gb and is priced likewise (£159 and £199). Amazon's commitment to the cloud also means it's offering unlimited storage in the heavens above for all Amazon content, which seems to be a smart move. 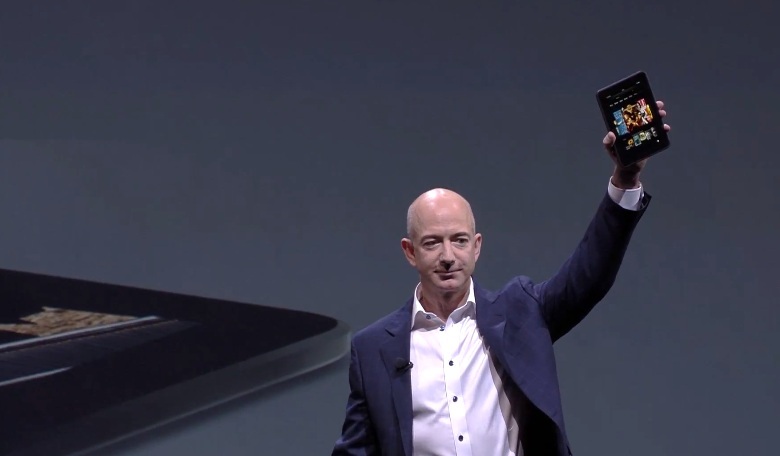 As is the way in which Mr Bezos also unveiled a brand-new, dedicated e-book reader called the Kindle Paperwhite. Exclusive to the US at release (expect it to follow the route of the original Fire), the touch-only Paperwhite is a response to the likes of the existing Nook GlowLight and the up and coming Kobo Glo that feature built-in light sources to allow users to read at night. It's an innovation within the Kindle range that arguably ought to have come sooner, but one that continues to allow the Kindle range to evolve. According to CEO Bezos, the device has 25-percent more contrast than the Pearl screens of the current crop of Kindle e-readers and 62-percent higher resolution. A battery life of around eight weeks isn't bad, either. New fonts are on their way too, while a new feature titled 'Time To Read' estimates how long it'll take you to read to the end of a chapter based on your current reading speed. The Paperwhite is available for pre-order at Amazon.com only for $119, or $179 for the 3G version. Is The Dark Knight Rises Blu Ray Set To Include Nolan's Director's Cut? moviesJason England September 6, 2012 Bane, Blu Ray, Christopher Nolan, DVD, Director's cut, GQ, Lindy Hemming, Nuke The Fridge, The Dark Knight Rises, Tom Hardy, Warner Bros.